The former first lady, found guilty of graft, could serve 6 to 11 years in prison for each of the seven counts of violating an anti-corruption law. 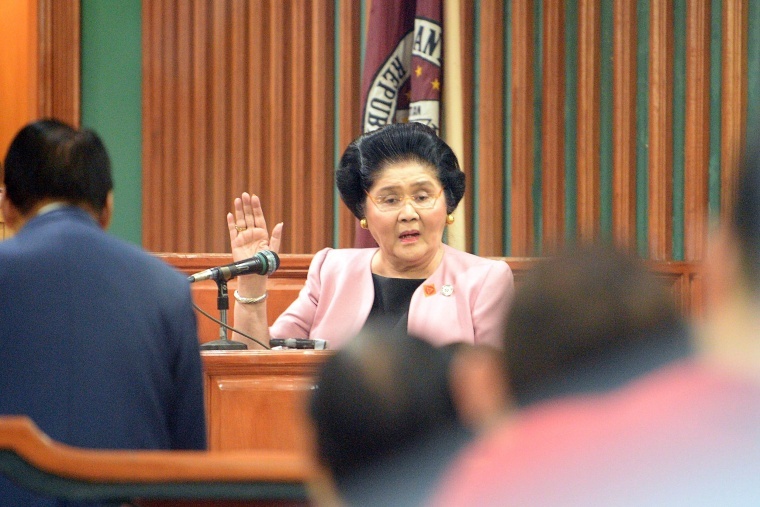 MANILA, Philippines — Former Philippine first lady Imelda Marcos on Friday posted a $7,400 bail for provisional liberty after she was found guilty of graft and ordered imprisoned. Marcos, 89, was convicted last week of illegally funneling about $200 million to Swiss foundations in the 1970s when she served as Metropolitan Manila governor while her husband, late dictator Ferdinand Marcos, placed the Philippines under martial law. She was ordered to serve 6 to 11 years in prison for each of the seven counts of violating an anti-corruption law. The court accepted the bond while it decides on her motion to remain free while she appeals the conviction. Marcos appeared before the anti-graft Sandiganbayan court in Manila, accompanied by her children and grandsons. She said she failed to attend the reading of her verdict because she wasn’t aware of it and also mentioned her frail health. Anti-Marcos activists and human rights victims have welcomed the conviction as long overdue, although there are doubts she’ll be forced to serve prison time given her age and social status. The cases against her were filed in 1991 and took nearly three decades of trial by several judges and prosecutors. She was once convicted of a graft case in 1993, but the Supreme Court later cleared her of any wrongdoing. Ferdinand Marcos was ousted by an army-backed “people power” revolt in 1986. He died in self-exile in Hawaii in 1989 but his widow and children returned to the Philippines. Most have been elected to public offices in an impressive political comeback.